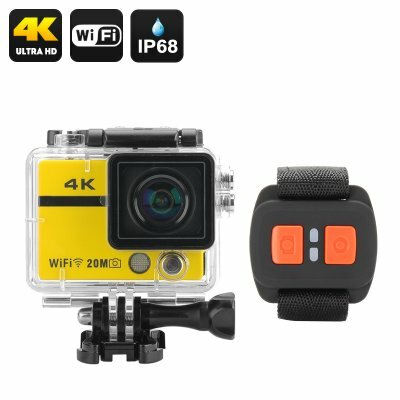 Successfully Added Ultra HD 4K Action Camera "Clarion" - 20MP, Sony CMOS, Wrist Remote Control, 170 Degree Lens, Wi-Fi, Loop Recording (Yellow) to your Shopping Cart. The “Clarion” action cam lets you create 4K footage @15 fps and full HD footage @ 60 fps - so, whether your adventures are super fast or you need more attention detail - with this 4K action camera, you’ll have it all. “Clarion” comes with a handy remote control, letting you trigger it remotely and find the best possible angle for that prefect shot. Speaking of angles, the action cam comes with a 170 degree wide angle lens so that you never miss out of any details in the background and will be able to capture beautiful nature scenes. I am really surprised by this great product for a great price ! The quality of the video' s and photo' s is high even if there is not much light. I use the action cam on my motorcycle. At a speed of 200 km/h the quality of the video is very good! Delivering was fast to the Netherlands by airmail.